The numbers are shocking. Just three out of 10 American adults are active enough to stay healthy and fit, and nearly four out of 10 admit they aren’t active at all, despite reams of research proving that exercise is a powerful preventive, and sometimes an antidote, for disability and illness. Which side of this divide are you standing on — and why? Maybe you’re not sure what blend of exercise is best. Or perhaps you know exactly what you need to do, but your workouts have become so humdrum that it’s harder than ever to dig up the energy to do them. Do you want to jump-start your sputtering exercise program? Or are you stuck on a plateau and wishing you could kick it up to the next level? This special report is just the ticket. The nine excellent workouts inside will challenge your body and spirit in a variety of ways while warding off boredom. 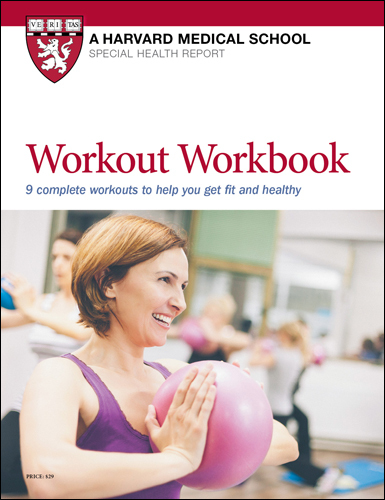 Each workout includes step-by-step instructions and photographs for every exercise. And we’ve designed the exercises so that you can tailor each one to your fitness level. Is an exercise too hard? Try the easier option. Too easy? We tell you how to make it more challenging. So go ahead. Set your goals. Check our safety tips. Select one or more workouts you’d like to master. And mix it up every month to six weeks to stay motivated. Your body — and mind — will thank you. How much time should you spend on exercise? Use the six tips below to be safe and make the best gains from your strength workouts. 1. Focus on form, not weight. Good form means aligning your body correctly and moving smoothly through an exercise. Poor form can prompt injuries and slow gains because you aren’t isolating muscles properly. “I often start people with very light weights because I want them to get their alignment and form right,” says master trainer Josie Gardiner. “It’s good to start off using light to moderate weight when learning an exercise routine.” Concentrate on performing slow, smooth lifts and equally controlled descents while isolating a muscle group. You isolate a muscle group by holding your body in a specific position while consciously contracting and releasing certain muscles. 2. Tempo, tempo. Control is very important. Tempo helps you stay in control rather than undercut gains through momentum. Sometimes switching speed—lower three counts, lift one count—is a useful technique for enhancing power. Follow the tempo specified in each exercise for better gains. 3. Breathe. Blood pressure rises if you hold your breath while performing strength exercises. Exhale as you work against gravity by lifting, pushing, or pulling; inhale as you release. 4. Keep challenging muscles. The right weight differs depending on the exercise. Choose a weight that tires the targeted muscle or muscles by the last two reps while still allowing you to maintain good form. If you can’t do the last two reps, choose a lighter weight. When it feels too easy to complete all the reps, challenge your muscles again by adding weight (roughly 1 to 2 pounds for arms, 2 to 5 pounds for legs); adding a set to your workout (up to three sets); or working out additional days per week (as long as you rest muscle groups 48 hours between strength workouts). If you add weight, remember that you should be able to do all the reps with good form and the targeted muscles should feel tired by the last two reps.
5. Practice regularly. 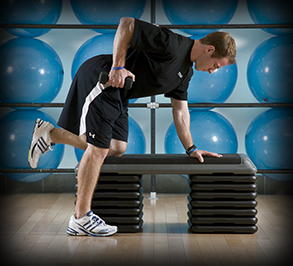 Performing a complete upper- and lower-body strength workout two or three times a week is ideal. 6. Give muscles time off. Strenuous exercise like strength training causes tiny tears in muscle tissue. Muscles grow stronger as the tears knit up. Always allow at least 48 hours between sessions for muscle to recover. If you’re doing a split strength session, you might do upper body on Monday, lower body on Tuesday, upper body on Wednesday, lower body on Thursday, etc.